This is a unique treatment that Lifetime Health & Wellness offers to patients with a variety of conditions. Just some of the benefits of Intramuscular Stimulation (IMS), also known as Trigger Point Dry Needling (TDN) include decreasing pain on an acute and chronic level, promoting healing, increase ROM, increase function. Watch the following video or read on to learn more about what this treatment is and how it works. This video is about the technique and organization by which Dr. Snyder received his training. The easiest way to think of this treatment is to relate it to a massage. The knots in your muscles that massage therapy often targets are similar areas of treatment for IMS (also known as Trigger Point Dry Needling-TDN). Often times these knots live at a deep level that fingers and hands just can't get to. Those knots are the goal of IMS. The needles used are very fine, thin, and flexible needles that are quickly tapped into the muscle and causes those knots to decrease; the muscle to loosen; and healing to begin, which ultimately decreases pain and increases proper function. Those knots in your muscles are known as Trigger Points. Trigger points are typically associated with muscle tightness and pain. 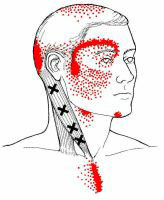 To the right is a representation of a trigger point in the neck denoted by the X and the referral pattern indicated by the red area. It is very typical for the trigger point's main referral region to be some distance away from the actual trouble spot in the muscle. Headaches are a great example of this. Treating the musculature in the neck and shoulders can quickly decrease the intensity and frequency of headaches. Intramuscular Stimulation (IMS) is a treatment for muscular tightness and spasms, which commonly follows injuries and often accompanies the degenerative processes or a chronically painful condition and dysfunction. Muscular tightness and spasms cause compression and irritation of the nerves exiting the spine. When the nerves are irritated, they cause a protective spasm of all the muscles to which they are connected. This may cause peripheral diagnoses such as carpel tunnel, tendonitis, osteoarthritis, decreased mobility and chronic pain. Small, fine needles are inserted in the muscles at the trigger points causing the pain referral. The muscles would then contract and release, improving flexibility of the muscle and decreasing symptoms. 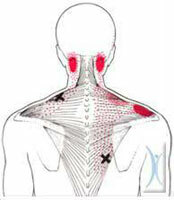 IMS treats these trigger points to release them and allow the muscle to heal. More and more doctors and therapists are incorporating trigger point dry needling into their practices. Incorporating the treatment technique with other manual and rehabilitative methods has been shown to be very effective in improving and hastening outcomes. IMS is an effective treatment for many physical conditions, even those conditions many think only surgery can help. It is worth investigating further. If you are curious if IMS might help you, please call our clinic, you'll be surprised how much it can help! How Will I Feel After A Session Of TDN? You may feel sore immediately after treatment in the area of the body you were treated, this is normal but does not always occur. It can also take a few hours or the next day before you feel soreness. The soreness may vary depending on the area of the body that was treated, as well as, varies person to person, but typically it feels like you had an intense workout at the gym. Soreness typically lasts 24-48 hours. If soreness continues beyond this, please contact our office. It is common to have bruising after treatment; some areas are more likely than others. Some common areas are shoulders, base of neck, head and face, arms and legs. Large bruising rarely occurs, but can. Use ice to help decrease the bruising and if you feel concern please call our office. It is common to feel tired, nauseous, emotional, giggly or "loopy", and/or somewhat "out of it" after treatment. This is a normal response that can last up to an hour or two after treatment. If this lasts beyond a day contact our office as a precaution. There are times when treatment may actually make your typical symptoms worse. This is normal. If this continues past the 24 to 48 hour window, keep note of it, as this is helpful information and Dr. Snyder will then adjust your treatment plan based on your report if needed. This does not mean TDN cannot help your condition. It is highly recommended that you increase your water intake for the next 24 hours after treatment to help avoid soreness. Avoid ice unless you are icing a bruise; Heat is better following TDN. Taking Tylenol, Ibuprofen/Motrin, aspirin etc. is ok as long as it does not interfere with any prescription medication or other conditions you may have. If you are unsure, consult your PCP. If you are feeling light headed, having difficulty breathing, having chest pain or any other concerning symptoms after treatment CALL us immediately. If you are unable to get a hold of us, call your Primary Care Physician.